Monitors - What are Holter, Event and Transtelephonic Monitors? Do they hurt or are they harmful? The Holter monitor, event monitor and transtelephonic monitors do not hurt. They do not cause any harm because they are recording devices, and they do not send out electricity. The ILR requires a small surgical incision that causes minimal discomfort for a few days. After that, there is no pain. Is there anything else to know about these devices? The Holter, event and transtelephonic monitors cannot get wet or they will become damaged. The ILR is protected by the skin so bathing and swimming with an ILR is fine after the wound has healed. The ILR will need to be removed when it is no longer needed. This is usually when the reason for the infrequent symptoms has been determined. Event monitors are small devices that are used by patients over a longer period (weeks to months, typically one month). Two sticky patches (electrodes) on the chest connect two wires to the event recorder. The monitor is always on but will only store the patient’s rhythm when the patient or caregiver pushes the button. Most monitors will save the rhythm for several seconds before the button is even pushed. The rhythm is also saved for a period after the button is pushed. A few specialized monitors are used only after the patient has symptoms. The intent is for most event monitors to be worn as much as possible every day to increase the chances of recording the patient’s rhythm when he/she has symptoms. Once a recording (sometimes more than one) has been made, it can be transmitted over the phone back to your heart center. Figure 2. show an Event monitor with leads. Some devices will store more than one event. Figure 3. 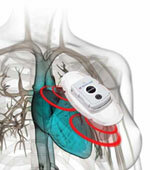 Transtelephonic monitor used with pacemaker patients. Each wristband is a lead that is worn by the patient during transmission of the rhythm. The white round magnet is used by some pacemaker patients to transmit specific data about the pacemaker.